Bumbleroot Organic Farm is owned and operated by two families - The Whalens and The Fishers. 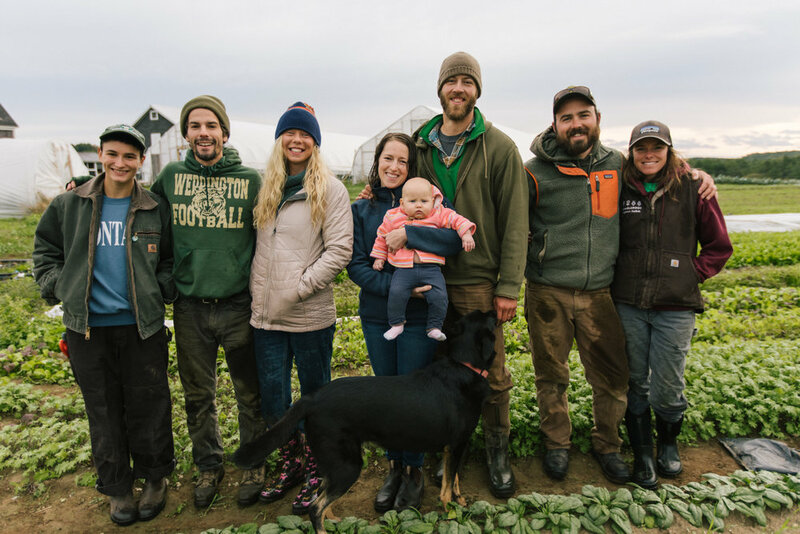 Both families live on our forever farm in Windham, Maine and together we are learning what it means to be farmers and business owners. We are thrilled to be a part of such a vibrant food community here in Maine, and we’re looking forward to another great year with our stellar team. Hailing from Massachusetts, Ben first gained an interest in agriculture working on a cattle ranch in California. He has since worked on farms in Colorado, Vermont, Massachusetts, and now Maine! He prefers his guitar turned up to 11 and loves the scent of lavender. His spirit animal is a Kodiak Bear. Roar. On the farm, Ben does everything from seeding greens to weeding and harvesting, and he handles all the fence building and accounting for Bumbleroot. On his days off you can find him building a house for his wife Melissa and his dog Bowie, or playing videogames. Born in neighboring New Hampshire, Melissa's love for growing food comes from eating, traveling the globe and studying herbalism. Her favorite food is ice cream and she'll take rainbow sprinkles over chocolate any day. She fancies herself ruler of the island of Catan. You can find Melissa in the field munching on tasty snacks and trying to keep up with Jeff, Ben and the farm dogs. She runs Bumbleroot's cut flower program, takes care of our budding event business, and updates the website when she has a free minute. Melissa can be reached at melissa@bumblerootorganicfarm.com. Jeff found his way to the east coast by way of Washington, Pennsylvania, Florida, and Colorado. He was born and raised in Iowa. Jeff loves cats, the NYTimes Best Sellers list, and existing in this world as a lefty. He is a wizard in the kitchen and dominates his fantasy football league. Every. Year. Jeff is our crop-planner, field-prepper, and heavy lifter. He builds things, fixes things, and makes sure everything gets done on time. Don't try to race him- you'll never win. He lives on the farm with his wife Abby, their new baby girl Josephine and their pup Sal. Jeff can be reached at jeff@bumblerootorganicfarm.com. Abby made her way to Maine following her passion for delicious food and beer after working in a hut in the White Mountains and on a schoolbus-turned-kitchen in Colorado. She prefers glades over groomers, and as a native Long Islander, she knows a good bagel when she eats one. Abby works full-time at Allagash Brewing Company, but we put her to work in the field on her days off. She's our marketing and newsletter magician, recipe tester, and she keeps the farm fridge packed with tasty brews. If you spot Abby on the farm or at a farmers’ market she’ll often have her cute daughter Josie in her arms. Abby can be reached at abby@bumblerootorganicfarm.com. Madison joined the Bumbleroot team in 2018. It was her first year farming and she’s hooked for life (or at least through 2019). She keeps Melissa on her toes in the flower field and loves writing lists. She came to farming through her love of herbs, goats and all living beings. Madison’s smile is infectious and her memory is impeccable. You’ll often find her warmly welcoming you at our farmers’ market tent in Monument Square or at our weekly CSA pick-up in Windham. We’re grateful to have her positivity and floral design skills around the farm for another year. Dan’s coming back for a second season at Bumbleroot in 2019. He is a weeding machine and a newly married man! When he’s not splashing around in the wash station you can find him hitting the basketball court in the West End for a pick-up game. Dan’s interests range from the NBA and video games to astrophysics and planning for the apocalypse. You won’t find anyone working harder on hot summer days than Dan Mickey…it must be his North Carolina blood. Look for Dan at markets or on the farm at our CSA pick-up and ask him to explain what a tesseract is. Bowie joined the farm back in July of 2015, and has officially filled the role of Bumbleroot safety officer. He always knows where everyone is and makes it his job to keep everyone in line (especially his pal Sal). He specializes in potato-digging, frisbee-playing, and keeping all birds out of our fields (very helpful indeed). He loves rolling around in anything brown. He's a farm dog if ever there was one- now we just need some animals for him to herd! Sally "Mustang" Fisher is our second-youngest Bumbleroot farmer (after Jo-Bess) and Bowie's bigger half. She gives him kisses all day long and reminds him to eat his breakfast when he forgets. She loves romping around, smiling, and welcoming any newcomer to the farm. Don't know what we'd do without her happy-go-lucky attitude; she reminds us not to take ourselves too seriously. The 2018 Bumbleroot team from left to right: Celia, Dan, Madison, Abby, Josephine, Jeff, Ben and Melissa.